This much maligned bird is widely disliked because of its feeding habits; magpies occasionally take bird eggs and chicks, small mammals and even adders (6). Yet they are often beneficial birds, perching on livestock and ridding them of ticks, and feeding mainly on pest insects (6), other invertebrates and vegetable matter (7). Magpies hoard food in holes in the ground during winter (7). They are notorious thieves, taking clothes pegs and other brightly coloured objects from gardens (6). Magpies are sociable birds, gathering in groups to roost, and occasionally forming noisy gatherings called 'magpie parliaments' (4) in the first few weeks of the year. It is thought that these gatherings are 'crow marriages', which allow unpaired birds to find a mate before the approaching breeding season (6). During spring, territories are defended, and fights may ensue. Both sexes help to construct the large roofed nest; the male brings nesting material while the female arranges it. 5-7 eggs are laid in April or May, and incubated for up to 18 days (6). After hatching, the chicks stay in the nest for 22-27 days, and rely on their parents for food for up to 8 weeks after leaving the nest. The fledglings stay with their parents throughout autumn and winter (6). There are many folk stories involving the magpie; it is thought to be associated with the devil in many parts of the country, and crossing oneself upon seeing one or saluting lone magpies is a practice that continues to this day in some areas. 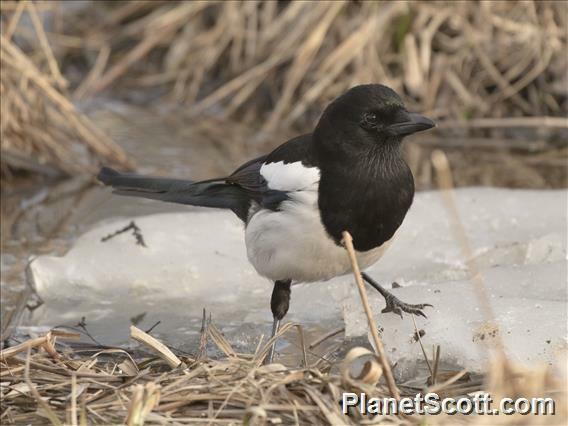 The magpie rhyme varies greatly, but usually begins: one for sorrow, two for joy (4). It is believed that the magpie refused to mourn Christ at the crucifixion, it is also said that the magpie refused to enter Noah's ark, instead sitting on the roof and swearing for the duration of the deluge (4). Common around town and in parks.